The Asian Society of International Law is seeking papers, on the theme of Asia and International Law: A New Era, to be presented at the Society's 3d Biennial Conference on August 27 and 28, 2011, in Beijing, China. The international community is now entering a new era, one in which a discernible shift has taken place in the distribution of global power. Asia, once more, is emerging as an extremely dynamic, prosperous, and innovative region. At the same time, it must be noted that Asia is an extraordinarily diverse continent; it contains many distinctive civilizations, and it includes states that are among the wealthiest and poorest in the world. Tensions exist between Asian states, and an overwhelming number of people in Asia continue to be vulnerable to oppression, poverty, environmental disasters, and the ravages of conflict. Submit online via this application form no later than 11 p.m. Beijing time on December 1, 2010. For information about the selection process, e-mail asocbeijing@gmail.com; for questions about the conference, e-mail secretariat@csil.cn. 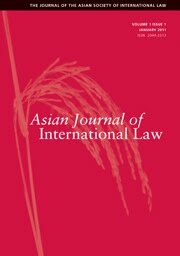 Authors whose papers (of 6,000 to 8,000 words) are accepted for the conference will be encouraged to submit them for possible publication in the Society’s new, peer-reviewed Asian Journal of International Law.